Anyone who knows me, knows that my mind is always going off on a tangent. Whether it be a case of simply daydreaming or the fact I change conversational direction often I am forever thinking. Knowing that I have to start painting my kitchen once again had me thinking about what my perfect kitchen would look like… if I won the lottery of course! 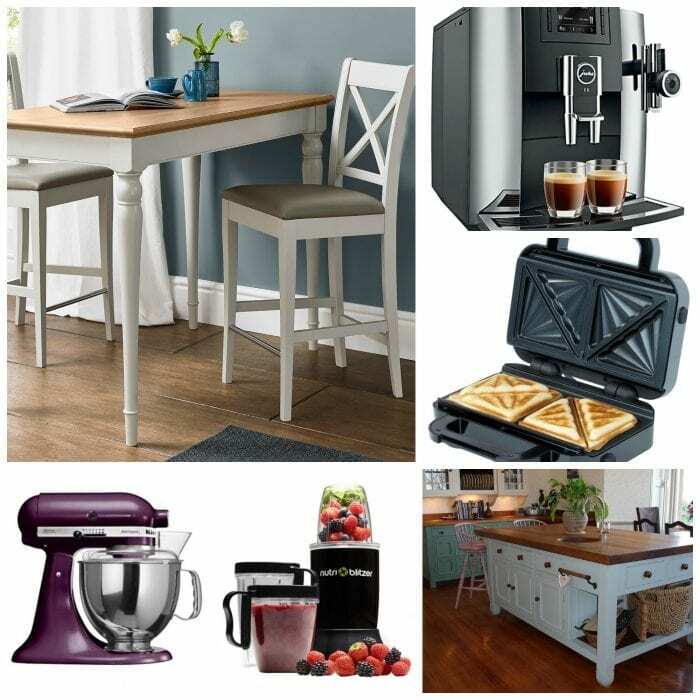 The mood board pretty much contains every item I would need in my ideal kitchen and dining room… minus the fridge! Thank you to the Fishpools dining rooms for the inspiration! I quite like the idea of a country style kitchen, all light and airy with the obligatory island in the middle with a constant aroma of baking bread. Checking out bar stool collections is only spurring my imagination on further! I imagine sitting on comfy a comfy bar stool flipping through social media at my island whilst munching on a ham and cheese toastie and sipping coffee made in the most awesome of coffee machines, the Jura E8 Bean To Cup Automatic coffee machine. Sounds ridiculously refined and perfect. Clearly I would need a Kitchen Aid in my ideal kitchen, it would simply sit in the corner, gleaming and unused. However my Nutri Blitzer would be utilised well to make up for the fact I would spend my life eating toasties. It would be the perfect open kitchen and dining room space for socialising, we all know a kitchen is where the party happens! If you could design your ideal kitchen, what would you include? I Have The Decorating Bug Again!